Perhaps one good thing people can say about Russian President Vladimir Putin as a person, is that’s he’s a certified animal lover. It seems like a lot of four-legged creatures take a shine to him, as evidenced by a Photo-shopped picture of him riding a running bear. But perhaps other than horses, dogs are the most frequent animal companions that Putin has. He’s even worked it into his image as Russia’s head of state, as evidenced in 2007 during a state visit in Sochi by German Chancellor Angela Merkel. Putin had a large black Labrador with him during a joint press conference with Merkel, and the mutt's inquisitive sniffing around Merkel had made the German leader visibly squirm for the cameras. Now another incident involving another of Putin’s canine companions has made the trending list at CNN. It’s no head of state the pooch in question is messing with this time, but the circumstances are rather unique anyway, as the dog and the victims actually came from the same country. The Russian president’s guests at the time were a delegation of two journalists from Japan and their camera crew, and his buddy for the day was Yume, a 4-year- old Akita. That, by the way, is a Japanese dog breed, and Yume in particular actually came from Japan. During the 2011 Tohoku earthquake and tsunami, Russia under Putin’s direction was one of the many countries that lent a hand for Japan to fix up its damages and get back on its feet again, easily done due to being close neighbors. A couple years later the Japanese government presented Putin with an Akita puppy, Yume, as a token of appreciation for his country’s assistance. The adorable tan and white dog quickly became a favored pet of Putin’s, who then taught him a variety of tricks with doggie treats for rewards. Back to recent developments, President Putin was granting an interview to journalists from the Nippon TV network and the Yomiuri Shimbun broadsheet newspaper on Wednesday. Before the interview proper, Putin walked into the room with the Japanese media delegation accompanied by Yume. Much to the uncomfortable amusement of the press corps, the Akita immediately got into a loud barking spell, laying on to the interviewers as if putting them in their place. 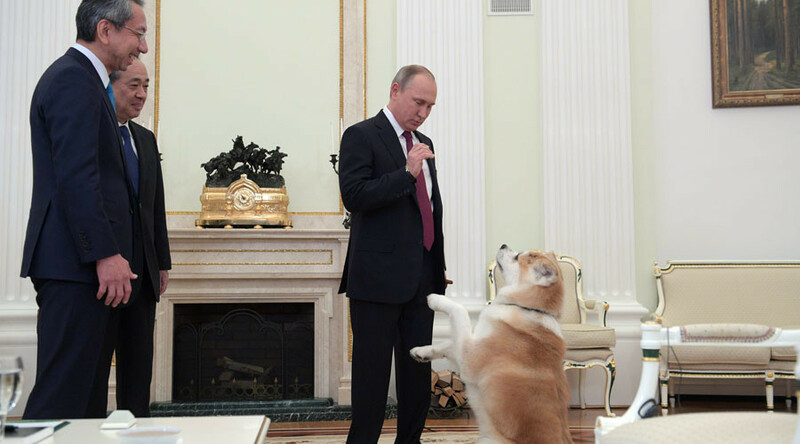 As the Nippon TV and Yomiuri journalists watched bemused and their cameramen clicked away, Yume continued to harangue them with barks until Putin called him back and calmed him down. The Russian president then entertained his guests by presenting an exhibition of Yume’s tricks, with treat rewards for each action. Later when the dog was sent off, Putin told the media-men that they were right to take caution in their posture, as Yume was trained to be a guard dog and he had thought the camera rigs were suspicious threats. That Putin sure knows how to make an impression.